WARNING! Do not reset factory defaults unless directed to do so by Primera Tech Support. Once you are in this menu select Factory Defaults - Select Restore Base. 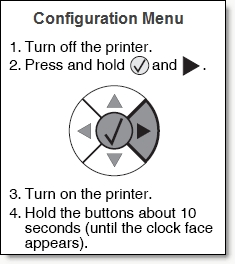 The printer menu will show a message that it is resetting and the main printer fan will turn on at the highest speed. Once the printer has returned to the Config Menu, switch off the printer and turn it back on to exit this menu and return to the main menu. 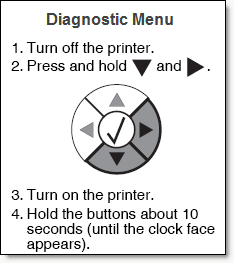 Once you are in the Diagnostic Menu select Printer Setup - Select Edge to Edge - Select *On. The menu will display "submitting..." Once the menu screen returns, turn off the printer and turn it back on again to exit this menu and return to the main menu. Note: When navigating all menus use the up and down arrow buttons to scroll through menu items. Some menus have more items than can be displayed on a single screen. Continue pressing the down arrow until all menu items are seen. A scroll bar on the right side of the menu screen will show your position on the menu. To select any item, press the check button.